Attacked and betrayed, Nick Seafort must lead a stranded ship to safety, in a science fiction adventure from the John W. Campbell Award-winning author. After his heroics aboard the Hibernia in Midshipman's Hope, Nicholas Seafort wins command of his first ship, the Challenger, and joins Admiral Tremaine's task force. Their first meeting is a rude awakening, however, as Tremaine demotes him to a smaller, overcrowded ship and blatantly ignores Seafort's report of alien life on Hope Nation. Above all, Seafort is anxious for his pregnant wife, who's due to have their baby on the journey. 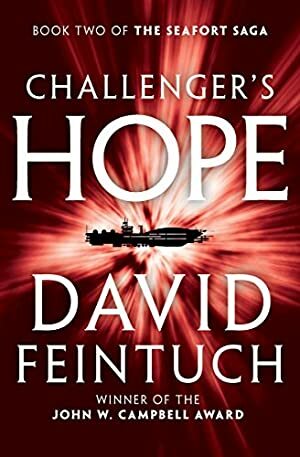 After an alien attack and an admiral's betrayal, a wounded Seafort is left stranded aboard a ship short of weapons and fuel. Hundreds of lives hang in the balance as Seafort must find a way to survive. Track It. This book reaches $1.99 about 3 times a year. Log In to track David Feintuch on eReaderIQ. to be notified each time the price drops on any book by David Feintuch. to stop tracking David Feintuch. We started tracking this book on January 12, 2013. The price of this book has changed 90 times in the past 2,288 days. The current price of this book is $7.99 last checked 4 hours ago. The lowest price to date was $1.99 last reached on March 21, 2019. This book has been $1.99 20 times since we started tracking it. The highest price to date was $7.99 last reached on March 23, 2019. We last verified the price of this book about 4 hours ago. At that time, the price was $7.99. This price is subject to change. The price displayed on the Amazon.com website at the time of purchase is the price you will pay for this book. Please confirm the price before making any purchases.